Leabhar den chéad scoth is ea ‘Dónall An Chluimh Agus An- Ocras Air’ a mheall na milliuin páiste le léaráidí bríomhara agus scéal simplí dóchasach. This timeless classic, loved by millions of children worldwide, brims with educational features. As children watch the little caterpillar munch through fruits and other tasty foods, they practise counting, explore colours and objects, and name the days of the week. There are lots of enticing peepholes for little fingers to explore… and a glorious surprise at the end! 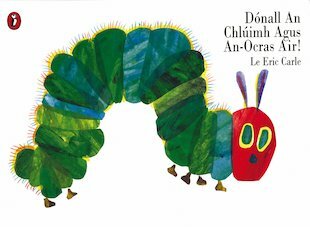 This special Gaelic edition tells the favourite story in a very simple translation which is great for boosting language skills. Colour the Very Hungry Caterpillar! Colour your very own caterpillar. What is your favourite meal? Draw it for the very hungry caterpillar to try! Eric Carle creates his artwork using collage. You can do the same to make your own caterpillar.